Stock of the AIBSNLEA EXECUTIVE DIARY-2018 has been exhausted now. Therefore, henceforth no order shall be entertained. The bills of dispatched diaries has already been sent to the consignee through Speed/Registered Post. Vendor No. 1004069 is applicable for all circles in ERP. AIBSNLEA has been grouped into non-GST Vendor. Kindly expedite payment during the March 2018 itself. So far, the DoT has been maintaining that BSNL employees are not eligible for 3rd Pay Revision. In today's meeting the Hon'ble Minister agreed that the issue of 3rd Pay Revision of BSNL employees would be processed and would be taken for the approval of the DPE and the Cabinet. This is a great achievement. We have broken the stalemate that prevailed in the Pay Revision issue. At the same time we have to be vigilant, till the final approval is given by the Cabinet. (2) Formation of Subsidiary Tower Company. The AUAB representatives expressed their apprehension that in the name of formation of the Tower Company, the 66,000 mobile towers of BSNL are being snatched away from BSNL. They also pointed out that the decision of the Cabinet that, the Subsidiary Tower Company would remain under the control of BSNL Management, has been violated, through the appointment of an IAS officer as the CMD of Subsidiary Tower Company. They further pointed out that even BSNL Management was not taken in to confidence in the appointment of an IAS officer as the CMD of the Subsidiary Tower Company, which clearly shows that the Subsidiary Tower Company would not be under the control of BSNL Management. The reply given by the Hon'ble Minister in this regard is not satisfactory. The AUAB has to find ways and means to ensure the rolling back of the Subsidiary Tower Company. During the discussions on the issue, GS AIBSNLEA raised the issue of additional increment on post based promotions under the provisions of executive promotion policy provisions which has been denounced by DoT vide letter dated 05.07.2017 and lakhs of rupees recoveries are taking place of BSNL executives and BSNL pensioners. He instantly submitted Hon'ble PB CAT judgment copy to Hon'ble MOSC (I/C) wherein the DoT order dated 05.07.2017 has been quashed. Hon'ble MOSC (I/C) immediately directed DoT administration to look into the matter. Now, we can expect that DoT may not go for appeal against the PBCAT order in this regard after this meeting. The representatives of AUAB strongly argued that pension revision should be done to the BSNL pensioners. It was pointed out that the BSNL pensioners and the Central Government pensioners are covered by the same rules. They argued that when pension revision is settled for the Central Government pensioners, the same should not be denied to the BSNL pensioners. The Hon'ble Minister assured that needful action would be taken to settle this issue. (4) Calculation of Pension Contribution. It was strongly argued that pension contribution in respect of BSNL employees cannot be calculated on the basis of maximum of the pay scale, when the same is calculated on the basis of actual basic pay, in the case of Central Government employees. It was pointed out that as per the DoP&T order issued in 2006, pension contribution of the Central Government employees is being deducted on the basis of actual pay only. The Hon'ble Minister directed the Secretary, DoT, that this issue should be settled as per Government orders. (5) Allotment of 4G spectrum to BSNL. The AUAB representatives pointed out that it will be extremely difficult for BSNL to compete with the private operators, without providing 4G service. They strongly argued that the proposal of the BSNL Management, for the allotment of 4G spectrum by the Government, should be accepted. The Hon'ble Minister replied in the positive and assured that needful action would be taken. (6) Reduction of retirement age from 60 to 58. The AUAB representatives strongly argued that the retirement age of the BSNL employees should not be reduced from 60 to 58, as a measure for the revival of BSNL. The Hon'ble Minister told that the government is not having any proposal to reduce the retirement age from 60 to 58. (7) Left out issues of the 2nd PRC. The AUAB representatives pointed out that this issue is lingering on very long time and needs to be settled. The Hon'ble Minister stated that this issue would be looked into by the Secretary, DoT. At the end of the meeting, the Hon'ble Minister stated that the representatives of AUAB could meet him again, as well as the Secretary, DoT, in continuation of today's meeting. The representatives of AUAB heartily thanked the Minister for his positive response to most of the issues. After the meeting with the Hon'ble Minister, a meeting of the AUAB was held in the FNTO's office. All the General Secretaries expressed their satisfaction with regards to the progress in the issues. They also expressed the view that all these have happened only because of the united struggles and massive mobilization by the entire Non-Executives and Executives, for which they deserve appreciation. 23.02.2018: BSNL Corporate Office issues orders for cancellation of transfer orders in the grade of Sr. Accounts Officer / Accounts Officer. 23.02.2018: DoT today withdrawn its earlier letter No. 24-1/2018-SR dated 21.02.2018 vide which latest status on the charter of demands of Unions and Associations was intimated denying all the demands. We salute and express our sincere gratitude to all the participating comrades in "March to Sanchar Bhawan" program on the call of All Unions and Associations of BSNL and making it a grand success. Today morning at 11.30 hrs in Eastern Court building of BSNL Corporate Office compound More than 5000 comrades gathered from nook and corner of the country to participate in the "March to Sanchar Bhawan". The March to Sanchar Bhawan was flagged off from the Eastern Court Building, Janpath to Sanchar Bhawan. Before commencement of the march all India leaders of different trade unions of CITU, INTUC, AITUC etc i.e. Comrade Shri Tapan Sen, Hon'ble Member of Parliament and Secretary General CITU, Shri Vidhya Sagar Giri, Secrteray, AITUC, Shri Jile Singh, INTUC leaders addressed the gathering and extended their full support to the struggle of BSNL employees. The March was forcefully ended by Delhi Police at Sansad Marg Police Station near Sanchar Bhawan. On the assurance of police to arrange a meeting Seretary Telecom March culinated in a big meeting which was adddressed by all the General Secretaries of participating Unions and Associations including Comrade Prahlad Rai, General Secretary, AIBSNLEA. A huge gathering of more than 5000 emoloyees gave patient hearing to all the speakers encouraging through slogans. More than 400 Comrades from AIBSNLEA BSNL Corporate Office Circle, Delhi Circle, Haryana Circle, Punjab Circle, Rajasthan Circle, Tamil Nadu Circle and UP (West) Circle participated in the March. After adjournment of the meeting all the General Secretaries of the Unions and Associations of BSNBL were escorted by Police to Sanchar Bhawan to arrange a meeting with Secretary (Telecom). Initially Secretary Telecom directed Police to take all the leaders to meet Special secretary (T), DoT but all the leaders categorically told that we will meet only and only with Secretary (Telecom) otherwise all the employees will be called in DoT to demonstrate immediately. After some time Secretary (Telecom) agreed to meet the leaders in committee room. Secretary (T) along with SS (T), JS (A) and Director (PSU) attended the meeting in the presence of Police and started discussions. All the leaders expressed their serious anguish against the negligent attitude of DoT administration towards the issues of BSNL employees even the Secretary (Telecom) is not granting meetings. They apprise in detail the justification of the demands i.e. implementation of 3rd PRC with 15% fitment benefits, settlement of let out issues related to 2nd PRC, pension revision of BSNL pensioners, Rollback of Tower Subsidiary, No reduction in retirement age from 60 to 58 years and no VRS etc. Secretary (Telecom) mentioned that she have been meeting with BSNL leaders on different occasions and she is not denying meetings. However, she explained that the issues are already in her knowledge but she is not the final authority to decide. Matter is being discussed tomorrow with Hon'ble MOSC (I/C), head of the organization for consideration. Regarding 3rd PRC Secretary (T) mentioned that matter has already been referred to DPE for comments. She further mentioned that she is supporting BSNL being a state owned company. All the General Secretaries of all Unions and Associations will meet tomorrow morning at 1100 hrs to discuss the strategies for the meeting with Hon'ble MOSC (I/C) and thereafter will meet with MOSC (I/C) at 12.30 hrs. The future course of actions will be decided all the outcome of the meeting with MOSC (I/C) and request the BSNL employees to implement ongoing agitation program of Work According to Rules successfully. a. Her intervention to check the conceited and cocky approach of head of FC section Circle Office Mumbai towards the executives especially AIBSNLEA members in accounts and finance wing in recent transfer and postings. 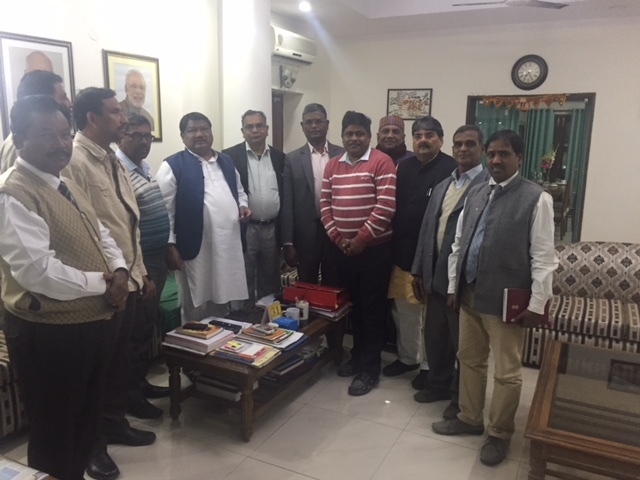 22.02.2018: Meeting with Hon'ble MOSC(I/C) with the representatives of All Unions / Associations of BSNL: Hon'ble MOSC(I/C) has fixed up a meeting with the representatives of All Unions / Associations of BSNL on 24.02.2018 [Saturday] at 12.30 Hrs. to discuss the demands. 21.02.2018: Meeting with GM (Estt. ):- GS, President and CS Tamil Nadu Circle met GM (Estt.) BSNLCO and discussed regarding the pay fixation under FR22 (I)(a)(i)- case of officiating JTOs. We requested for implementation of Hon'ble High Court Kerala Judgement. GM (Estt.) mentioned that Estt. Cell was of the opinion for its implementation but legal cell of BSNL CO has suggested to file SLP in the Hon'ble Supreme Court according action is being taken. However, any review may be considered by the competent authority only i.e. Dir (HR) / CMD BSNL. He advised to take up the matter with Dir (HR). 21.02.2018: Meeting with GM (FP): GS, President, FS and CS Tamil Nadu Circle met GM (FP) and discussed regarding consideration of some request / tenure transfer cases of AOs / CAOs / DGM (F). GM(FP) mentioned that all the representation in this regard are being examined shortly decision will be taken. a) CPC from JTO to SDE, SDE to DE, DE to DGM, JAO to AO, AO to CAO, JTO(C/E/TF) to SDE(C/E/TF), SDE(C/E) to EE(C/E): We requested to initiate CPCs to fill up all above vacant Group-B and Group-A equivalent posts subject to outcome of the Court Cases. Jt. GM (Pers.) mentioned that as demanded by our association the draft proposal to initiate CPCs to fill up the vacant Group-A and Group-B posts subject to outcome of Court Cases is being prepared and shortly it will be presented to CMD BSNL and Dir (HR) for consideration. DE to DGM left out promotions: Jt.GM (Pers) mentioned that MA has been filed in Hon'ble High court Chandigarh. Shortly the direction will be received thereafter only further necessary action will be taken. b) Consideration of request / tenure transfer cases of some SDE, DE and DGMs: Jt. GM(Pers.) mentioned that the in the first week of April 2018 all pending cases will be considered. 21.02.2018: GS writes to Ms. Anuradha Mitra, Member (Finance), Telecom Commission, DoT, New Delhi for grant of meeting on some important issues of BSNL executives. 21.02.2018: DoT vide letter number 24-1/2018/SR communicated CMD, BSNL with respect to the agitation notice by All Unions and Associations of BSNL - Massive March to Sanchar Bhawan on 23.02.2018. Through this letter DoT has apprised the status of demands wherein all the demands have been denied which is the most frustrating situation. DoT instead of settling the issues in the interest of BSNL's viability and its employees denying the settlement of the legitimate demands. The meeting of All Unions and Associations of BSNL held today to discuss the strategies for successful implementation of the "March to Sanchar Bhawan" on 23.02.2018 at 11.30 Hrs. It is decided that the March to Sanchar Bhawan will start from Bharat Sanchar Bhawan / Eastern Court, Janpath New Delhi to the Sanchar Bhawan sharp at 11.30 Hrs. The eminent trade union leaders will address before start of the rally at Eastern Court. All the participating Circles are requested to bring their Circle Banners, Demand Play Cards etc in the rally and reach in time. Participating Circle Secretaries of AIBSNLEA from out stations should inform the number of their participating members to CHQ immediately latest by 22.02.2018 before 14.00 hrs. so that their lunch packets may be arranged in time. Also inform their stay program at Delhi so that their stay arrangements may be made to avoid inconvenience. 1. Shri Anupam Shrivastava, CMD BSNL, regarding release of Art Works for advertisements of BSNL products – Our submissions regarding. 2. Shri Anupam Shrivastava, CMD BSNL, regarding Requesting to accord priority for early finalization of disciplinary case Shri B. Ganeshan, DGM who is going to retire on superannuation on 31.03.2018. 3. The Director (HR), BSNL Board, regarding Requests for transfer / posting / cancellation / retention in the Cadre of DGM (F). (a) Implementation of 3rd PRC in BSNL: We requested Director (HR) to use her good office in DoT to get the approval of DoT on 3rd PRC implementation in BSNL. Director (HR) mentioned that BSNL proposal is still pending in DoT for consideration but so far no positive decision is taken in this regard. (b) Grant of Special C/L to the office bearers of AIBSNLEA for attending Association meetings for its smooth functioning of Association: Director (HR) assured to look into the matter. (c) Holding of CPCs to fill up the vacant Group-'A' and Group-'B' level posts: We requested for holding of CPCs to fill up the vacant Group-'A' and Group-'B' level posts subject to outcome of court cases. Director (HR) mentioned that she has already directed GM (Pers.) to put up the matter for consideration. She assured an early action in this regard. (a) Holding of CPCs to fill up the vacant Group-'A' and Group-'B' level posts: We requested for initiating the CPCs to fill up the vacant Group-'A' and Group-'B' level posts. GM (Pers.) mentioned that shortly he is going to give a presentation to CMD, BSNL/Director (HR), BSNL Board on the status of pending court cases & further action to initiate the CPCs. He assured an early action in this regard. (b) Implementation of Hon'ble SC judgments on TES Group-'B' seniority: We requested for the Implementation of Hon'ble SC judgments related to TES Group-'B' seniority. He informed that Hon'ble Apex Court judgment of 147 SDEs of LDCE quota has been send to legal cell of BSNL Corporate Office, New Delhi for legal opinion, which is expected shortly. Rule-206 of TES Group-'B' officers seniority judgment of Hon'ble SC is being examining for its implementation. 20.02.2018: Meeting with GM (Admin), BSNL Corporate Office, New Delhi: GS, President met GM (Admin) BSNL C.O. and requested for extending medical reimbursement without vouchers for BSNL pensioners & allow same facility to the BSNL serving employees. GM (Admin) mentioned that extension of medical reimbursement without vouchers is under consideration for BSNL pensioners and it is pending in Budget Cell of BSNL C.O. for comments thereafter only the decision will be taken. GS along with GS / BSNLEU and GS / SNEA met DDG (Estt), DoT regarding pension revision of BSNL pensioners. We requested him that DoT should not link pension revision with the pay revision of BSNL serving employees which is not justified since the BSNL pensioners are not related with the affordability of BSNL. During their service their pension contribution has already been paid to DoT. We requested him to de-link the pension revision of BSNL pensioners from the case of pay revision of BSNL serving employees. DDG (Estt) assured to look into. GS along with GS / BSNLEU and GS / SNEA met Secretary (Telecom), DoT and requested for considering the BSNL's proposal for implementation of 3rd PRC recommendation with 15% fitment benefits in BSNL. We expressed our concern that the BSNL Board recommendations in this regard are pending in DoT for the last three months but no steps have been taken so far for its implementation. We further requested that DoT should relax the "Affordability Clause" of 3rd PRC or should take relaxation from Union Cabinet in the interest of BSNL and its employees. We pleaded that BSNL employees are working with their full commitment for the growth of BSNL and also timely completing the various Govt. projects like BHARAT NET, NFS & LWE etc. Pay revision in BSNL is must to keep motivated the BSNL employees and in the interest of the viability of BSNL. Delay in consideration of pay revision has caused serious frustrations, resentment and demotivation amongst the BSNL employees. We explained that most of the BSNL employees were DoT employees only before their absorption in BSNL and as per Govt. of India Policy, after formation of the BSNL they exercised their option for taking absorption in BSNL under the assurances of better pay, promotion and pension but now the same is being deprived off on one pretext or another. Regarding pension revision of BSNL pensioners, we apprised her that DoT Pension Cell is linking the pension revision with the pay revision of BSNL serving employees which is not justified since the BSNL pensioners are not related with the affordability of BSNL. During their service, their pension contribution has already been paid to DoT. The DDG (Estt) every time is explaining that in case the pension revision is done for BSNL pensioners without the pay revision of BSNL serving employees there will be anomalies in the pension. He is explaining that in case the pension is revised without considering the pay revision of BSNL serving employees, in that case BSNL pensioners retired prior to 01.01.2017 will draw more pension than the BSNL pensioners who retired or retiring after 01.01.2017. In this regard, we requested Secretary (Telecom) for her kind intervention for resolving the issue. We also apprised Secretary (Telecom) regarding no initiation on wage revision negotiation of non-executives with non-executives Unions on the pretext of pending revision of pay scales of executives. Secretary (Telecom), after giving patient hearing assured an early action in this regard and mentioned that Hon'ble MOSC (I/C) is also telling in all the meetings that we will consider the case. We extended thanks for granting the meeting. Only a limited stock is available of the BSNL EXECUTIVE DIARY-2018. The Office Bearers who are coming to Delhi on 23.02.2018 to participate in the "March to Sanchar Bhawan" may collect their copy by hand from Shri N.L. Sharma, AGS (HQ), AIBSNLEA [Mob: 9868115301]. It would be appreciated that prior intimation in this regard may be communicated in advance so that their packets can be arranged to save time. Also may be dispatched immediately if they feel convenient. a) Implementation of 3rd PRC in BSNL: We requested CMD to use his good office in DoT for the approval of BSNL Board decision on 3rd PRC implementation and we also requested CMD BSNL to arrange a meeting with Hon'ble MOSC (I/C) and Secretary, DOT with all Unions and Associations of BSNL to discuss their demands. CMD BSNL assured to arrange a meeting within a couple of days. b) Filling up of the vacant of Group-A & Group-B posts: We requested to hold CPCs to fill-up the vacant Group-A and Group-B posts on Adhoc basis subject to outcome of the pending Court Cases. CMD mentioned that after our earlier meeting on this issue he has issued necessary instructions to GM (Pers) and advised us to discuss the matter with GM (Pers) for an early action. c) Implementation of CPSU cadre Hierarchy: CMD mentioned that the matter was discussed in the last BSNL Board meeting held on 08.02.2018 wherein Govt. nominee Director has asked to reply some of his queries. Thus after the approval from BSNL Board the matter will be sent to DOT for clearance. We further requested that the CPCs should be conducted simultaneously till the time CPSU Cadre Hierarchy is implemented. 19.02.2018: GS writes to Smt. Sujata T Ray, Director (HR), BSNL Board regarding discontinuance of LAA in the grade of Executive Engineer (Civil). It is learnt that Screening Committee report of AGM (Regular) is not received in BSNL Corporate Office from AP, BR, CHTD, HR, HP, JKND, MH, MP, NE-II, NETF, PB, ETP, STP, UPE, UPW, UKND WB and TLNG circles. (a) Requests for transfer / posting / cancellation / retention in the Cadre of Accounts Officer. (a) Requests for transfer / posting / cancellation / retention in the Cadre of JTO. Congratulations! AIBSNLEA's consistent efforts yielded results in getting delivered a favourable judgment by the Hon'ble PBCAT New Delhi for quashing the DoT letter dated 05.07.2017 which rescinded grant of an extra increment on post based promotion under EPP. Hon'ble PB CAT New Delhi has issued orders in OA No. 2649 quashing DOT Order dated 5/7/2017. While writing the judgment Hon'ble PBCAT has mentioned that "The applicants have basically prayed for retention of para I.II (v) of the EPP (Annexure A-2, which has been duly approved by the Government according to its policy. There has been no policy change as such in the Government in regard to the service conditions of the BSNL employees. The controversy has arisen only on account of P&T audit unnecessarily trying to compare financial upgradation under the EPP with that under the MACP, not realizing that these two schemes are applicable to two separate set of employees. 11. In the conspectus of the discussions in the foregoing paras as well as considering the background of introduction of EPP, I am of the view that the impugned Annexure A-1 order dated 05.07.2017 is not at all legally as well as ethically justifiable. Its retention would create trust deficit between the BSNL employees and the Central Government, which is also unwarranted. Hence, I quash and set aside the impugned Annexure A-1 order dated 05.07.2017. Accordingly, the OA stands allowed. This judgment is a glaring example about the of working of AIBSNLEA which fights sincerely and legally for the interests of all employees without any discrimination. On the call of the "All Unions and Associations of BSNL" "March to Sanchar Bhawan" is being organized on 23rd February 2018. The march will start at 1130 AM from BSNL Corporate Office, Janpath, New Delhi. Circle Secretaries of AIBSNLEA BSNL Corporate Office Circle, Delhi Circle, Haryana Circle, UP (West) Circle, Rajasthan Circle and Punjab Circle are requested to bring their maximum number of participants along with their banner in this march. Further, all the Circle Secretaries are requested to intimate number of participants in this march to CHQ latest by 19.02.2018 for making their lodging and boarding arrangement. A. Holding of CPC for promotion from AO to CAO: We requested for initiation of the CPC for promotion from AO to CAO. GM (FP) mentioned that let GM (Pers) take the action regarding the CPCs for promotion from JTO to SDE and SDE to DE. Similar action will be taken by SEA cell also. B. Consideration of some request / tenure transfer and modification in transfer cases of AOs / CAOs / DGMs: We requested for consideration of some genuine request / tenure transfer and modification in transfer cases of AOs / CAOs / DGMs. GM (FP) assured to look into. A. Holding of CPCs to fill-up the vacant Group "B" and Group "A" level posts: We requested to hold CPCs for promotions from JTO to SDE, SDE to DE and DE to DGM in Telecom Engineering wings, JAO to AO, AO to CAO and CAO to DGM in Finance wings, JTO (C/E) to SDE (C/E), SDE (C/E) to EE (C/E), JTO (TF) to SDE (TF) etc subject to outcome of the court cases. GM (Pers) mentioned that he will take the legal opinion and based upon that further necessary action will be taken in this regard. B. Implementation of Hon'ble Supreme Court judgments on TES Group "B" seniority: We requested for implementation of Hon'ble Supreme Court judgments on TES Group "B" seniority with respect to the Rule 206 and 147 LDCE quota SDEs seniority court case and related judgments. GM (Pers) assured an early action in this regard. C Implementation of CPSU Cadre Hierarchy in BSNL: GM (Pers) informed that shortly he will go and discuss the matter with Joint Secretary (Admn), DoT and the Govt. nominee in the BSNL Board of Directors to know about his queries. The queries will be replied by the Management to the DoT and after its acceptance further course of action will be taken. D Consideration of some request / tenure transfer case of SDEs / DEs / DGMs: We requested for consideration of some genuine request / tenure transfer case of SDEs / DEs / DGMs. GM (Pers) assured to look into. 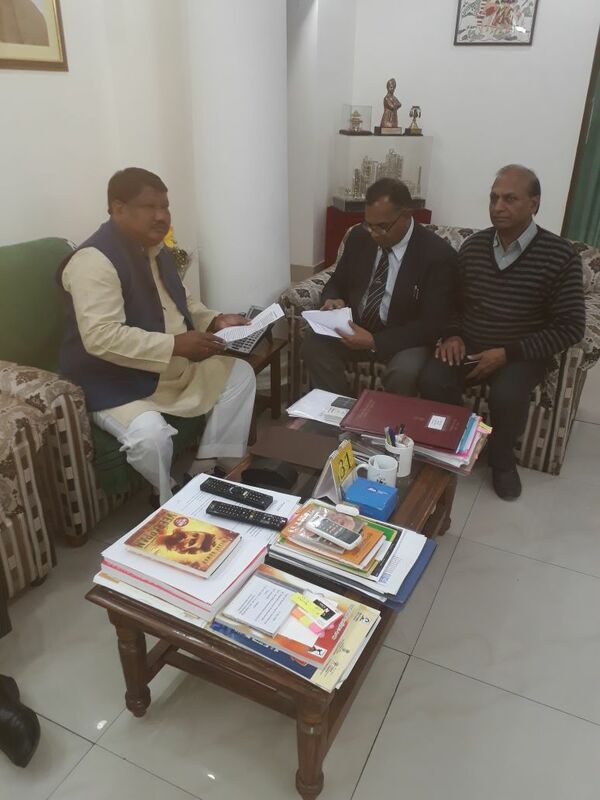 12.02.2018: Meeting with OSD to Hon'ble MOSC(I/C): GS, President , AGS (HQ) met Shri Anand Kumar OSD to Hon'ble MOSC(I/C) and requested him for arranging a meeting of BSNL Unions and Associations with Hon'ble MOSC(I/C) regarding implementation of 3rd PRC in BSNL and creation of BSNLs Tower Subsidiary etc. We apprised him in brief about these demands. OSD appreciated our concern and assured to discuss the matter with Hon'ble MOSC (I/C) for granting us a meeting at the earliest. a) Implementation of 3rd PRC in BSNL:- We requested Dir (HR) to use her good office in DoT for the approval of BSNL Board decision on 3rd PRC implementation. Dir (HR) mentioned that she has already discussed the matter with PS to Hon'ble MOSC(I/C) and Member (Finance) and will further discuss the matter. She also confirmed that CMD BSNL is also trying to arrange a meeting with Hon'ble MOSC (I/C) with all Unions and Associations of BSNL to discuss their demands. b) Implementation of CPSU cadre Hierarchy: Director (HR) mentioned the matter was discussed in the last BSNL Board meeting held on08.02.2018 wherein Govt. nominee Director has mentioned that they will like to study the draft proposal and have some queries to reply by BSNL. Thus after the clearance from DoT BSNL Board will take a decision for its implementation. c) Filling up of the vacant of Group-A & Group-B posts: We requested to hold CPCs to fill-up the vacant Group-A and Group-B posts on Adhoc basis subject to outcome of the pending Court Cases. Director (HR) assured to discuss the matter with GM (Pers). 12.02.2018: Meeting with Jt. GM(Pers):GS, President met Jt. GM(Pers) and discussed regarding. a) CPC from DE to DGM left out cases: We requested to expedite CPC from DE to DGM of left out cases. Jt. GM(Pers) informed that CPC was held up due to stay order on promotion granted by Hon'ble High Court Chandigrah direction to consider catchup rule on promotions. Jt. GM(Pers) informed that MA has been filed in the Hon'ble High Court Chandigarh for an early hearing in the case. b) Implementation of CPSU cadre Hierarchy: Jt. GM(Pers) informed that Govt. nominee Director has mentioned that they will like to study the draft proposal and have some queries to reply by BSNL. Thus on receipt of the queries from the Dot the reply will be sent. However, he mentioned that some suggestions and views given by AIBSNLEA have been incorporated in the revise proposal for example considering Jt. DGM Designation in E-5 Grade, Grading marks of APAR etc. regarding other issues service weightage cutoff date of implementation SC/ST roster implementation etc. may be discussed and further clarified. We retreated our stand and requested to consider our views before its approval to avoid further litigations. c) Modifications of SDE(RR): Jt. GM(Pers) informed that pers. Cell moved a proposal to BSNL Board for withdrawing the agenda of modification of SDE(RR) from BSNL Board but the competent authority i.e. Secretary Telecom. Has not allowed to withdraw the item from BSNL Board Agenda. Thus the items has to be discussed in the BSNL Board meeting for modification if considered. Shri Rakesh Shrivastava, President, All India Retired BSNL Executives Welfare Association (AIRBSNLEWA) and our veteran leader took his last breath on 08.02.2018 at 12.30 Hrs on the way to hospital after becoming sick at Faridabad at his residence. We convey our heart fealt condolances to the grieved family and pray the almighty God to rest soul in peace. AIBSNLEA has brought BSNL EXECUTIVE DIARY-2018 containing updated information on service matters mostly concerning the BSNL employees and also important information on Telecom Engineering, Financial matters including GST. The Executive Diary is having full page for each day. Now, only a limited stock is available. 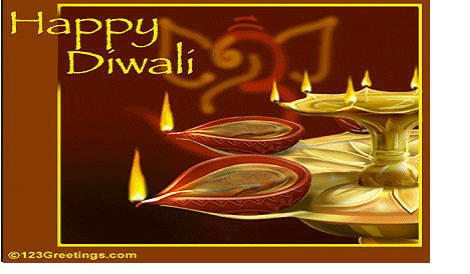 So, it is requested to kindly hurry up to avoid last minute disappointments. The RTGS / NEFT transaction particulars may please be communicated through email at the earliest to square off the account. It is learnt that Hon'ble MoS (I/C) for Communications in a VIP reference has clarified that the employees who were permanently absorbed in BSNL from DoT are getting pension on the basis of combined service in DoT and BSNL on IDA pattern in terms of Sub-Rule (10) of Rules 37-A of CCS (Pension) Rules, 1972. It is stated that pension revision follows pay revision. Earlier also, pension of permanent absorbees in BSNL drawing pension in IDA pattern has been revised on implementation of 2nd PRC in 2007. Accordingly, case of pension revision of the employees permanently absorbed in BSNL will be taken-up as and when 3rd PRC is implemented in BSNL. GS, AGS (HQ) met GM (Pers) and discussed regarding out come of discussion of BSNL Board meeting on agenda items pertaining to HR vertical. GM (Pers) informed that there was some discussion on CPSU Cadre Hierarchy proposal in BSNL. But, Govt. nominee Directors has mentioned that they have some queries to make. Thus the discussions remained inconclusive. Now, Govt. nominee Directors will send their queries which will be replied and thereafter matter may be discussed further in Board meeting. GS, FS met Shri A. N. Rai, OSD to Hon'ble MOSC (I/C) and requested him to arrang a meeting with Hon'ble MOSC (I/C) to discuss our demands to provide justice to BSNL employees and in the interest of BSNL's viability. Shri Rai assured an early action in this regard. GS, FS met Shri P. K. Sinha, Advisor (Finance), DoT and discussed regarding settlement of the Pension cases of BSNL Pensioners on account of DoT letter dated 05.07.2017 and prior to 2004 on the issue of allowing increment in the same pay scale on promotion. Advisor (F) mentioned that already respective CCAs have started settling the cases and about 123 Pension cases pending in Kerala Circle are also being settled shortly. Instructions from DoT have been issued. GS, FS and AGS (DR) met GM (Pers.) and discussed about the draft CPSU cadre hierarchy proposal to be submitted in tomorrows BSNL Board meeting. We requested GM (Pers.) that the suggestions made by AIBSNLEA must be addressed in proposal before being it tabled to BSNL Board. GM (Pers) intimated that he has already conveyed Director (HR) about the concerns raised by AIBSNLA. He sought brief of major points. 1. Ignorance of length of service and seniority: in proposed draft the length of service and the seniority is categorically ignored as it equalise the services of 25 years with 5 years. Therefore we suggested that instead of implementation from 01.01.2017 it should be from the date of last CPC held in that cadre and the year of recruitment otherwise it will not be beneficial to the executives in the Cadre(s) having more than 5 years' service. GM (Pers) told that it will result in two notional promotions, we told that BSNL is paying the 2 or 3 upgraded scales, so clubbing of services in next upgraded post can be a option. 2. Increase of residency period for AGM grade from 7 years to 12 years: Residency period from SDE/Sr SDE to AGM and equivalent cadre should be maximum 7 years only. 3. MT Recruitment: We opposed the MT recruitment provision at STS level in the CPSU cadre hierarchy and mention of Adhoc promotions on STS posts. We told that as per the direction given by CMD, there should be non-post based functional promotion upto AGM level then why the question of Adhoc promotions on AGM posts arises. The Adhoc promotion takes place against the vacancies and post based promotions. 4. Conduction of CPCs before switching to CPSU CH: We reiterated our stand that all pending CPCs should be completed and promotion orders should be issued immediately subject to outcome of court cases as there is no stay on issuing Promotions orders. About 10,000 SDE (T), 3,500 AGM, 500 DGM, 1,000 AO, 1,000 CAO, 100 SDE (Civil), 200 EE (Civil), 150 SDE (Electrical) and some Telecom Factory Posts are lying vacant which are to be immediately filled-up. We also requested to early implementation of Hon'ble Apex court order in Rule 206 and 147 cases. GM (Pers.) assured to work out some way to complete the CPCs and issue promotion orders and to intimate our views regarding the CPSU Hierarchy to the Management. A. CPSU Cadre Hierarchy Proposal in BSNL: We requested CMD BSNL to consider our apprehensions and suggestions on the proposed CPSU Cadre Hierarchy Proposal in BSNL before being it tabled in the BSNL Board meeting being held on 09.02.2018. CMD BSNL assured to look into. B. Filling-up of the vacant Gr. "B" and Gr. "A" Posts by conducting the CPCs: We requested CMD BSNL for filling-up of the vacant Gr. "B" and Gr. "A" Posts on adhoc basis subject to out come of the court case. CMD assured to look into the matter. A. Pension revision of BSNL Pensioners: We requested to consider immediate revision of pension of BSNL Pensioners. Director (Estt.) mentioned that as per ruling position there is provision for revision of pension in isolation till the time pay revision of serving employees in BSNL takes place. We pleaded that BSNL pensioners are not playing any role in the profit or loses of BSNL and during their service period pension contribution to DOT was paid. Thus their pension revision should be dealt separately. Director (Estt) further mentioned that Hon'ble MOSC (IC) has replied to VIP references that there is no rule exists through which revision of pension of BSNL pensioners is ascertained. The revision of pension can be considered by DOT, only with the consent of Nodal ministries and Cabinet approval after revision of pay scale of serving employees of BSNL. B. Withdrawal of additional increment on the post based promotion in the same scale under EPP: Director (Estt) mentioned that DOT letter dated 05.07.2017 is still in existence and accordingly action needs to be taken by BSNL. Further any review may be consider only after the receipt of the judgement from Hon'ble PB CAT New Delhi in the case filed by AIBSNLEA. The judgment copy is yet to be released by Hon'ble PB CAT, ND. A. Implementation of 3rd PRC Recommendations in BSNL: We requested to approve the BSNL's proposal on Implementation of 3rd PRC Recommendations in BSNL. SST mentioned that in view of affordability clause of the 3rd PRC recommendations the case of BSNL is not covered, thus DoT has not taken any action and no case is now pending in DoT. We pleaded that pay revision in BSNL is must to keep motivated the employees and in the interest of viability of BSNL. SST mentioned that this point he has already pleaded before Cabinet Secretary in the meeting of secretaries that BSNL is the biggest PSU and having maximum man-power after railways hence affordability clause needs relaxation but the Cabinet Secretary did not consider any relaxation. He further mentioned that now this matter can be reviewed through Political decision, DPE or Cabinet Secretariat only. He advised that you achieve Rs. 32,000/- Crore revenue then only DoT may reconsider the case. C. Payment of pension contribution on actual basic pay of BSNL employees: We requested to consider the Payment of pension contribution on actual basic pay of BSNL employees. SST mentioned that He is not convinced in this regard and cannot recommend the case to the DOE. He gave justification that when one employee enters in lower scale and retires in higher scale, his pension contribution is varying but the payment of pension is being paid on the last pay drawn which is high. We pleaded that same thing is happening in Govt also but pension contribution is being taken on actual basic pay of the employee. But he was not ready for the argument. D. Reduction of retirement age from 60 years to 58 Years in BSNL: We enquired about the move of DOT on Reduction of retirement age from 60 years to 58 Years in BSNL. SST mentioned that the issue pertains to revival plan of BSNL and it has no relevance with the implementation of 3rd PRC report in BSNL and in DOT nobody has power to negotiate on this line on pay revision. E. MTNL merger with BSNL: SST mentioned that yesterday Hon'ble MOSC (IC) has replied in the parliament that there is no such proposal is under consideration in DOT presently in view of the Financial position of BSNL. F. Allocation of 4 G spectrum to BSNL: We requested for allocation for 4G spectrum to BSNL for a fair competition in the market. SST mentioned that matter is under active consideration and shortly final decision will be taken. G. Filling-up of the vacant Gr. B and Gr. Posts in BSNL: We requested SST to use his good office for filling-up of the vacant Gr. B and Gr. A Posts in BSNL for which all the CPCs have been stalled in the name of pending court cases. SST assured to look into and categorically mentioned that the CPCs can be conducted and the vacant posts can be filled-up on adhoc basis subject to out come of the court case. 1. Non-cooperation to NOFN and other government projects. As per the call of the All Unions and Associations of BSNL, the employees of BSNL are observing 'Work According to Rule' from 30.01.2018. This struggle was reviewed in the meeting of All Unions and Associations of BSNL, held yesterday the 06.02.2018, as well as in the Steering Committee meeting held today. After detailed discussion, it has been decided to observe Non-cooperation to NOFN and other government projects. This decision is taken in view of the fact that the DoT and the government have denied justice to BSNL employees in the matter of 3rd Pay Revision, pension revision to BSNL retirees, forming the Subsidiary Tower Company, etc. Entire Non-Executives and Executives are requested to strictly observe this Non-cooperation, in addition to implementing the 'Work According to Rule' call. The All Unions and Associations of BSNL is writing to the Secretary, DoT and to the CMD BSNL, about the struggle of Non-cooperation to NOFN and other government projects. 2. Employees, other than those who are posted in marketing section, are requested not to participate in mela, road-show, or in any other marketing activity. 3. Protest demonstrations to be conducted on every Wednesday. As a part of intensifying the 'Work According to Rule' programme, it has been decided to conduct protest demonstrations on every Wednesday. Circle and district secretaries are requested to effectively conduct these demonstrations, by coordinating with other constituents of the All Unions and Associations of BSNL. Efforts should be taken to mobilise maximum number of employees in these demonstrations. All the Circle / District Secretaries are requested to ensure strict compliance of the above decisions. GS & CS Kerala Circle met Director (HR), BSNL Board and discussed regarding. a) Pay protection case of officiating JTOs under rule FR22(I)(a)(i). We requested Director (HR) for the implementation of Hon'ble High Court Kerala Judgement for protection of pay of officiating JTOs under rule FR22(I)(a)(i). Director (HR) advised us to discuss the matter with CGM (Legal) BSNL, CO and GM (Estt.) BSNL CO and assured to look into the matter after their advice. b) Implementation of CPSU cadre hierarchy: We requested for implementation of CPSU cadre hierarchy by considering the views / suggestion given by our Association. Director (HR) informed that CPSU cadre hierarchy proposal approved by BSNL Management Committee will be discussed in the BSNL Board Meeting which is scheduled to be held on 09.02.2018 and assured to apprise our concern to the BSNL Board before its approval. c) Implementation of 3rd PRC: We requested Director (HR) to use her good office in getting approved the BSNL's proposal on 3rd PRC implementation. Director (HR) mentioned that matter will be resolved with the kind intervention of Hon'ble MOSC (I/C) only and we people have to take up the matter with Hon'ble MOSC (I/C) for its resolution. We apprised her about our efforts being made to convince the DoT officers and the officers in Hon'ble MOSC (I/C) office. d) Reduction of retirement age from 60 years to 58 years: We opposed the move of DoT for reduction of retirement age from 60 years to 58 years. Director (HR) mentioned that BSNL Management is also of the opinion that reduction of retirement age from 6o years to 58 years will not help the BSNL in view of ongoing huge retirements rather it will adversely affect its functioning and viability. e) Revision of pension of BSNL pensioners: Director (HR) mentioned that DoT should de-link revision of pension of BSNL pensioners from the revision of pay scales of the BSNL serving employees. GS, CS Kerala Circle met CGM (Legal) BSNLCO and GM (Estt.) BSNLCO and requested regarding implementation of Hon'ble High Court Kerala Judgement for the pay fixation of officiation JTOs under rule FR22 (I)(a)(i). After detailed discussions they assured to look into the matter. All the representatives of All Unions and Associations of BSNL meeting held yesterday and discussed regarding implementation of Five Days Satyagrah program and Work According to Rule. The Satyagrah program was successfully organized and implemented through out the country and now we all have to concentrate on implementation of Work According to Rule program. Also decided the strategies to organize "March to Sanchar Bhawan" on 23rth February 2018 wherein more than 3000 BSNL employees are to participate from all over the country with their Unions/Associations banners/play cards etc. The "March to Sanchar Bhawan" on 23rd February 2018 will start at 1130 AM from BSNL Corporate Office, Janpath New Delhi. Regarding successful implementation of Work According to Rules program will be discussed and decided by steering Committee which will meet on 07.02.2018 at 1500 Hrs. All the Circle / District Secretaries are requested to ensure their maximum participation in the March to Sanchar Bhawan on 23rdFebruary 2018 by reaching in time at New Delhi. Also ensure effective implementation of ongoing "Work According to Rules" program. The Meeting with Hon'ble Minister of State for Communications (I/C) could not be held yesterday due to his busy schedule due to the ongoing Parliament session. The meeting was arranged through Hon'ble Minister of Tribal Affairs Shri Jual Oram. 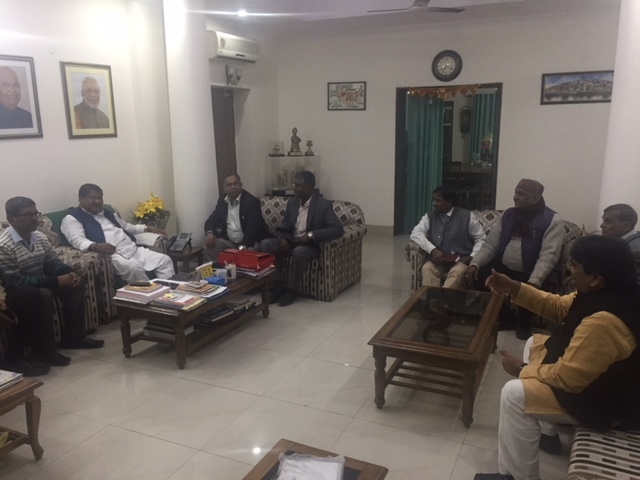 However, all the representatives of All Unions and Associations of BSNL met Hon'ble Minister of Tribal Affairs Shri Jual Oram and handed over a brief note on the demands and requested him to arrange a meeting with Hon'ble MOSC (I/C) Shri Manoj Sinha Ji at the earliest to appraise him about our demands. Hon'ble Minister of Tribal Affairs Shri Jual Oram assured to discuss the matter with Hon'ble MOSC (I/C) for granting an early meeting. 06.02.2018: Change for option for contribution in Employees' Pension Scheme. BSNL Corporate Office issues directions to all the CGMs with regard to the stand on EPF. The "All Unions and Associations of BSNL" are meeting Shri Manoj Sinha, Hon'ble Minister of State for Communications at 5:00 PM tomorrow (06.02.2018) on the issues of Wage revision, Subsidiary Tower Company, rolling back of the retirement age from 60 to 58 and revision of pension issues etc. Com. R.G. Dixit, CS NFTE, Raj. Circle in his inaugural speech elaborate about Satyagraha Programme call given by All Unions and Associations of BSNL and welcomed GS AIBSNLEA. Com. Prahlad Rai, GS AIBSNLEA attended and addressed the gathering of non-executives/executives of all associations/unions in PGMTD Campus, Jaipur in launch hour during Satyagraha Programme call given by All Unions and Associations of BSNL and extended thanks for assembling in large number on a short notice and making the meeting great success. GS in his address explained the reasons that why this agitation programmes is launched and elaborated the indifferent attitude of Govt. towards BSNL since its formation. He mentioned that Govt. is not only created but responsible for BSNL's present situation. GS mentioned that due to un-helping and over-jealous attitude of some officers in the Govt. i.e. non-payment USOF Charges i.e. 2000 Crores/Annum from July 2011, withdrawal of ADC from July 2008, Exhausting 36000 Crores BSNL reserve, non-refund of spectrum charges (3G & BWA) of Rs. 18,500 Crores, non-reimbursement of licenses fee, payment of interest on notional loan Rs. 7500 Crores to DoT has adversely affected the viability of BSNL. In addition of this Spectrum Allocation and bidding process on highest bidding rates are the example of step behavior of Government towards BSNL, which is a Government owned company. He mentioned that five days Satyagraha Programme is ending today wherein we have tried on PAN India level to explain DoT/BSNL Management that 3rd PRC is our right & we will not compromise below 15% fitment in 3rd PRC and also requested to withdrawal of Tower subsidiary & dropping reduction in retirement age from 60 to 58 year immediately. GS opposed the move of the Government for the creation of Tower Company and expressed its negative impact on BSNL. He also explained how 'Work According To Rules' is to be implemented in the days to come in order to achieve our goal. He also mentioned that its a 'Do & Die' call for employees as well as BSNL and implementation of 3rd PRC with 15% fitment will definitely saves both and keep BSNL survived. Com.M.K. Morodia, CS AIBSNLEA, Raj. Circle and Sh. S.S. Rajput, CS SNEA Raj. Circle also attended and addressed the gathering. Com. Ashok Pareek, CS BSNLEU Raj. Circle extended vote of thanks. 02.02.2018: Representatives of All Unions and Associations of BSNL meet the Director (HR). Director (HR) called all Unions and Associations for the discussions on 02.02.2018 regarding the ongoing agitations. President, AIBSNLEA CHQ attended the meeting. GM (SR) was also present in the meeting. Union / Association leaders explained that on earlier occasions, management arranged the meetings with the Secretary/DoT or the Hon Minister as the case may be and through discussions, issues are settled. However, such initiatives are not found nowadays, during agitations. Director (HR) assured to make possible efforts for meeting at DoT once CMD returns on Monday. All Unions and Associations will be meeting on 06.02.2018. (2) Shri Manoj Sinha, Hon'ble MOS (C) (l/C), Govt of India requesting policy support and suitable compensation to BSNL in lieu of NOFN (BharatNet) and other Govt. project works being executed by BSNL.